Eleanor Lutz, a designer in Seattle with a Bachelor’s degree in molecular biology from the University of Washington (where her research was in teaching mosquitoes to fly through mazes), has turned her talents to scientific visualization. Her wonderful site, Tabletop Whale, features a weekly animated GIF illustrating both the principles and the beauty of a scientific phenomenon. Watch them move: more (and larger) animated GIFs at Tabletop Whale. As we wonder at the working of the world around us, we might recall that it was on this date in 1810 that Crown Prince Ludwig (later to become King Ludwig I) invited the citizens of Munich to help celebrate his marriage to Princess Therese of Saxe-Hildburghausen with horse races and a feast lubricated liberally by beer. The festivities were held on the fields in front of the city gates, named Theresienwiese (“Theresa’s meadow”) in honor of the Crown Princess, although the locals have since abbreviated the name simply to the “Wiesn.” The event was such a success that the Crown Prince decided to repeat it the following year– and so the tradition of Ocktoberfest was born. 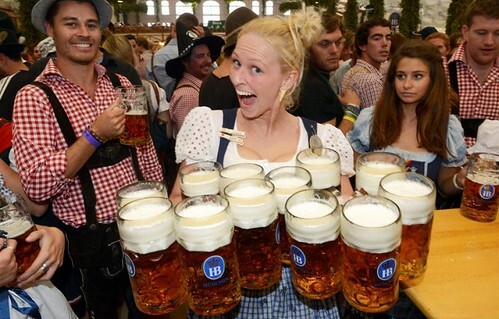 The current version of celebration begins in late September and runs through the first Sunday in October, and involves the serving of over 1 million gallons of beer.